The automatic transaxle fluid level should be checked regularly. Keep the vehicle on the level ground with the parking brake applied and check the fluid level according to the following procedure. 1. Place the selector lever in N (Neutral) position and confirm the engine is running at normal idle speed. 2. After the transaxle is warmed up sufficiently (fluid temperature 70~80°C (158~176°F), for example by 10 minutes usual driving, move the shift lever through all positions then place the selector lever in “N (Neutral) or P (Park)” position. 3. Confirm that the fluid level is in “HOT” range on the level gauge. If the fluid level is lower, add the specified fluid from the fill hole. If the fluid level is higher, drain the fluid from the drain hole. 4. If the fluid level is checked in cold condition (fluid temperature 20~30°C (68~86°F) add the fluid to “COLD” line and then recheck the fluid level according to the above step 2. The transaxle fluid level should be checked when the engine is at normal operating temperature. 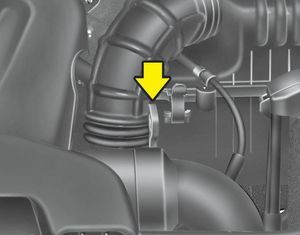 This means that the engine, radiator, radiator hose and exhaust system etc., are very hot. Exercise great care not to burn yourself during this procedure. Low fluid level causes transaxle slippage. Overfilling can cause foaming, loss of fluid and transaxle malfunction. To avoid sudden movement of the vehicle, apply parking brake and depress the brake pedal before moving the shift lever. “COLD” range is for reference only and should NOT be used to determine transaxle fluid level. New automatic transaxle fluid should be red. The red dye is added so the assembly plant can identify it as automatic transaxle fluid and distinguish it from engine oil or antifreeze. The red dye, which is not an indicator of fluid quality, is not permanent. As the vehicle is driven, the automatic transaxle fluid will begin to look darker. The color may eventually appear light brown. Therefore, have an authorized Hyundai dealer change the automatic transaxle fluid according to the Scheduled Maintenance at the beginning of this section.